Staying out of debt has long been the standard for responsible money management. For generations parents have drummed that into the heads of their irresponsible offspring: pay your bills on time and repay what you owe. 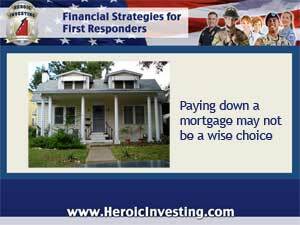 But in today’s financial climate, not paying off certain debts is a better financial strategy – and home mortgages head the list of “good debts” to have. Bnakrate’s financial gurus point out that many mortgage holders shouldn’t put extra money toward paying off a mortgage until they’ve paid down high interest credit card balances, established an emergency fund to cover living expenses, and added money to retirement plans or college savings funds. Because of the low rates and the numerous refinancing options offered by lenders eager to keep customers, a mortgage payment may actully be one of the least pressing financial obligations a property owner can have.